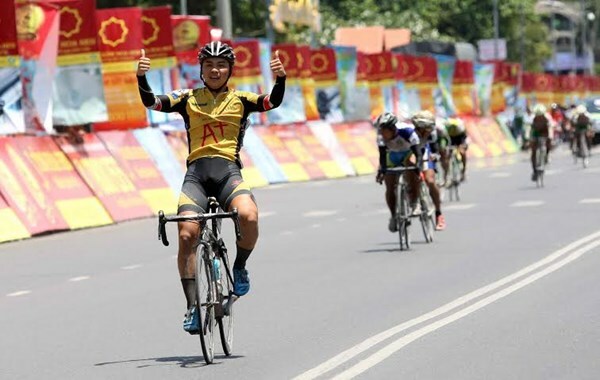 HCM CITY (VNS) — Nguyen Luu Thanh Nhan came first in the 13th stage of the 27th HCM City Television Cycling Cup yesterday. Nhan of Mathnasium-HCM City rode solo for the last 2km of the 134km-long stage from Tuy Hoa to Nha Trang City, which he completed in 3:34.38. Chau Hong Hau and Nguyen Van Duc of VTV Can Tho came second and third. Nguyen Minh Viet of BTV Binh Duong took the yellow jersey for the best time of 34:44.48 after 13 stages. Quang Van Cuong of Ha Noi and Nguyen Hoang Giang of Gao Hat Ngoc Troi An Giang are runners-up. Viet also heads to take the white jersey as the best young cyclist. The green jersey award for the best sprinter went to Le Van Duan of VUS-HCM City with 77 points.